Big Data is completely transforming how companies drive their decision making, but many nonprofit organizations are unprepared to make the most of this opportunity. Nonprofit organizations are vital to making meaningful change in the world and they have significant amounts of untapped potential in their data. Unfortunately, many nonprofits lack the strategies, skills, and guidance to make better engagement, fundraising, advocacy, and program decisions based on their data. 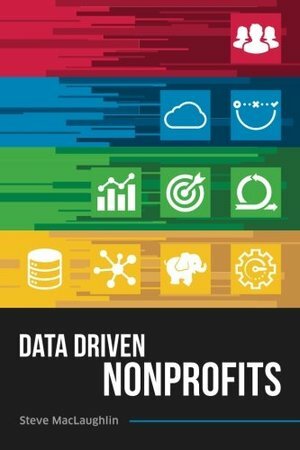 Data Driven Nonprofits is a guide book for nonprofit organizations that want to improve their performance and increase positive change in the world. Learn from industry leaders and nonprofit professionals that have unlocked the keys to becoming more data driven. Data driven nonprofits accelerate change in the world when staff use data to influence strategy and inform decisions that produce value and impact. Author Steve MacLaughlin is a respected nonprofit industry, fundraising, and online giving expert. He explores how data driven nonprofits are shaping the world and what makes them successful. Data Driven Nonprofits will help you understand: • Why data is important to you and your nonprofit organization • How the nonprofit sector, technology, and big data are converging • What are some of the challenges to becoming more data driven • Why the culture of a nonprofit organization plays such an important role • How organizations of all sizes and causes have become more data driven • What the future holds for nonprofits that embrace a data driven mindset Data Driven Nonprofits contains insights and interviews from more than 20 respected charity sector experts. First-hand stories from not-for-profit organizations like Memorial Sloan Kettering Cancer Center, University of South Dakota, Indiana University, Worldwide Cancer Research, SCIAF, Royal National Institute of Blind People, Project HOPE, Denver Rescue Mission, Florida State University, Humane Society of the United States, VolunteerMatch, Crisis Text Line, and charity: water are featured throughout the book.